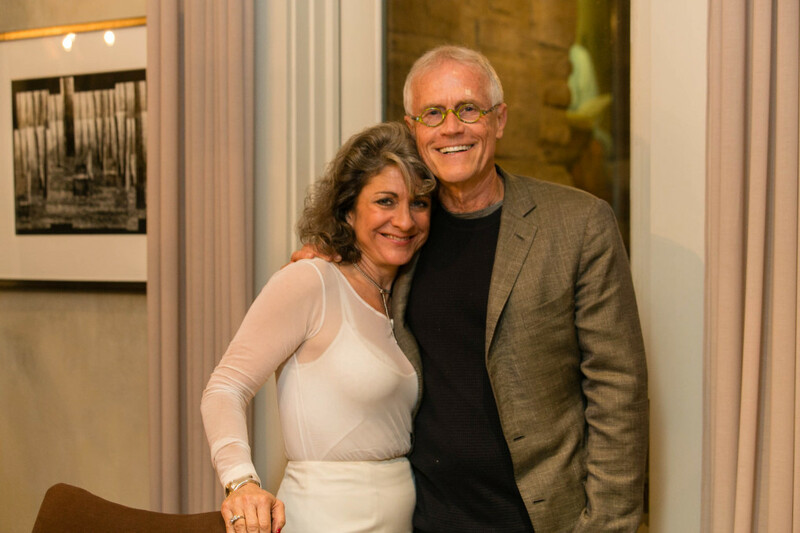 Ray connected us with so many people who helped inform and shape our vision, and one of them was Paul Hawken, an environmentalist, entrepreneur, journalist, author and one of the world’s foremost leaders on sustainability. Paul wrote The Ecology of Commerce; Growing A Business; Natural Capitalism; and Blessed Unrest: How The Largest Movement in the World Came Into Being And Why No One Saw It Coming. Paul has affected world change with his books, and when he speaks I’m so taken with his passion for the environment. So when he called and asked me to get a group of influential women together who could potentially become investors in a new hair color product he was working on, I said yes. It was my way of repaying the favor Ray had done for us all those years ago. 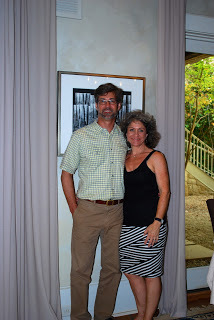 Paul stayed at Serenbe for three days. One night he presented his product and the next day he was spoke at our first Creative Changemaker Series. But on that first night, we had a private dinner for him with the members of Steve’s Biophilic Institute group. I found whole chickens from a farm in South Georgia at Fern’s Market, roasted them and served them with the feet and everything. Fresh chickens vary, but this free-range and scratch fed, which means it was lean and very delicate, not big and moist like chickens you might find in the grocery store. I served it with sautéed cabbage and roasted okra on the side. Rub the chicken all over with olive oil, salt and pepper. Take whole sprigs of fresh thyme and put it into the cavity of the bird and under the skin of its breast. Roast it at 375 degrees for 20-25 minutes until fork tender. When it’s done, let the meat rest a bit and squeeze fresh lemon juice all over it before cutting into small pieces and serving. On a recent spring weekend, the Southern Chefs Series welcomed Chef Andrea Reusing of Chapel Hill’s Lantern Restaurant to my kitchen. What a weekend it was! One of the most exciting aspects of the series for me is the exposure to the many talented chefs and the range of menus, flavors, and experiences they bring to their class. It’s such a joy to have the opportunity to try different types of cuisine in an intimate class setting. Sometimes we “travel” to other regions of the country through a guest chef’s chosen menu, and other times, I feel as though we boarded a plane and landed in an exotic locale. 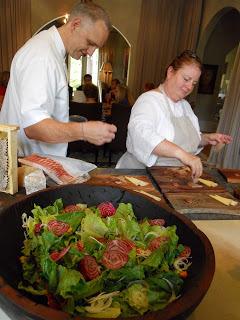 We traveled far with Andrea and what a culinary journey it was! Andrea’s menu was inspired and clever. On Sunday afternoon, we prepared and then enjoyed warm paneer, kombacha and date salad with red watercress, vadouvan shrimp with spicy carrot puree and cardamon rice, and Louisiana tangerine sorbet with candied kumquat. 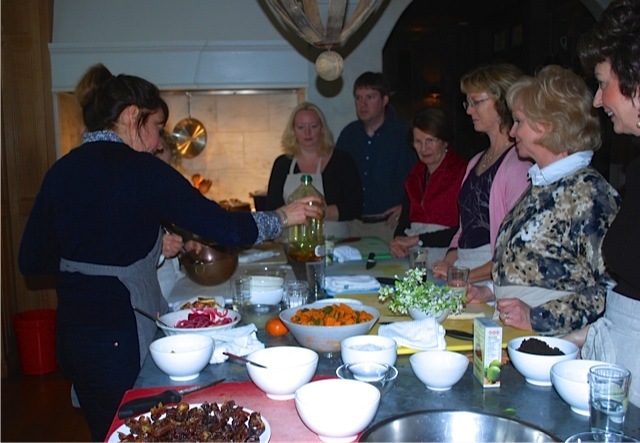 In Monday’s class, we prepared and happily consumed all night pot-au-fen (French beef stew) with spring vegetables in broth and crushed strawberry mess (see recipe below). 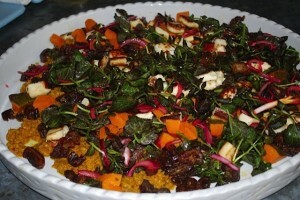 Kombacha and date salad with red watercress – it’s gorgeous! 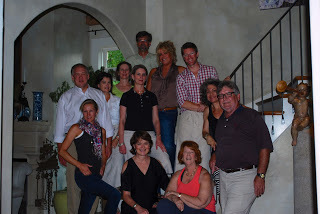 We are having a fabulous time with each guest chef in the 2013 expanded Southern Chefs Series. There are still spaces available in future classes. Proceeds from this year’s series benefit Wholesome Wave. 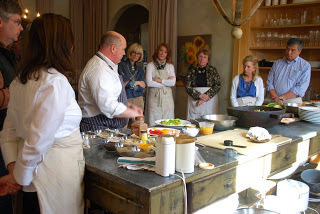 Visit the Inn at Serenbe online for information on upcoming classes and call the Inn to register for Southern Chefs Series classes, 770 463 2610. Place the strawberries in a medium bowl and sprinkle with the sugar and salt. Crush them with a potato masher or large fork until they are juicy and a spoonable consistency but still chunky. Let the strawberries sit for 15 minutes before serving. In the meantime, combine the cream, the sugar or honey, and the vanilla seeds and pulp in a medium bowl (save the vanilla pod for another use). With a whisk or an electric mixer, whip the cream until it is thickened and softly set but not firm. Whip the yogurt and fold together. 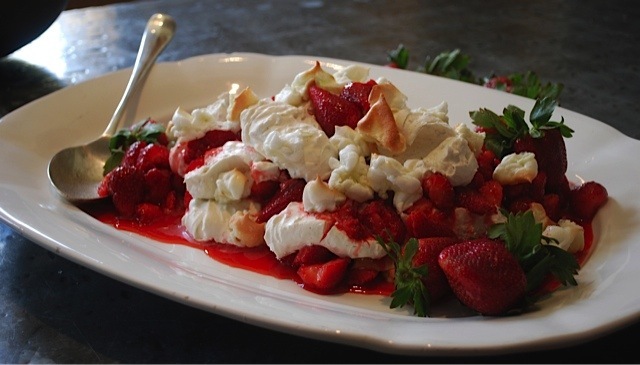 To serve, arrange the meringues, strawberries and juice, and the cream in layers on a platter or individual plates. 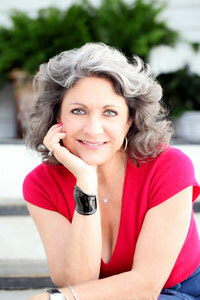 Oh, the thrill…The Southern Chefs Series‘ February guest chef was Anne Quatrano. 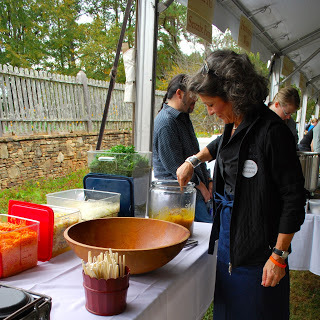 I adore Anne, queen of Star Provisions, Bacchanalia, Abattoir, Quinones at Bacchanalia, Floataway Cafe, and Summerland Farms. 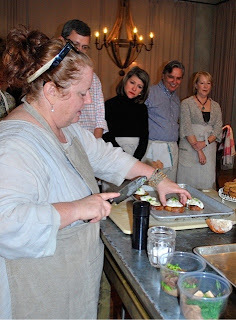 Chef Anne graced this past weekend’s class with her wit, stories, tips and techniques, and infinite wisdom. The 10 class participants held on her every word and eagerly tested their new or refined skills in the preparation of two sumptuous meals. Dinner featured a salad of winter citrus, radish, fennel, Caramont Farm Esmontonian cheese, and Summerland Farms microgreens; pan-seared halibut, green garlic, greens, fine herbs, and preserved Meyer lemon; quail with heirloom grains, roasted mushrooms, and preserved pears; chocolate souffle with chantilly cream; and madeleines. Lunch was a feast of celery root soup, pickled Vidalia onion, and pesto; peeky toe crab toast (see recipe below); winter lettuces with pecan, apple, lemon, and olive oil; and ginger cookies. I am invigorated in the presence of Anne and always learn something new from her. By the buzz in my kitchen, I think the others felt the same. There was great energy and camaraderie among the group. 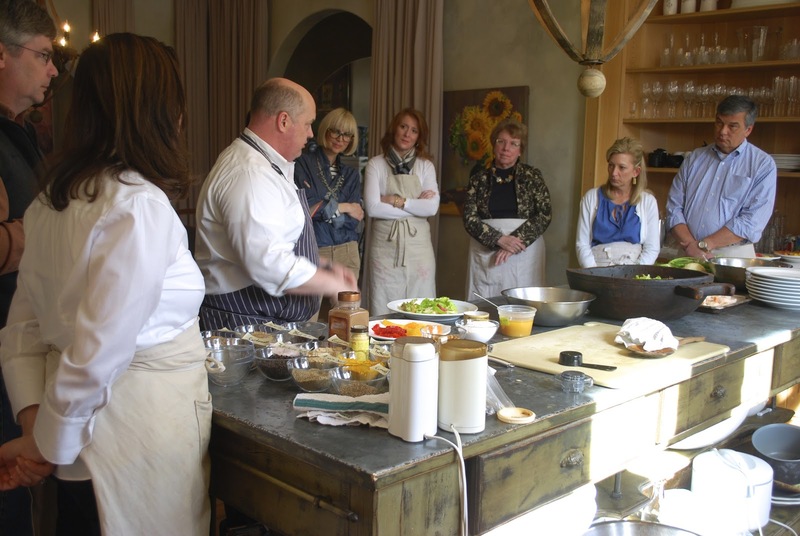 The beauty of the Southern Chefs Series classes is participants get to learn from the best of the South’s best in a casual, intimate setting. We work together to create delicious and memorable meals and leave knowing we can recreate these meals in our own kitchens. 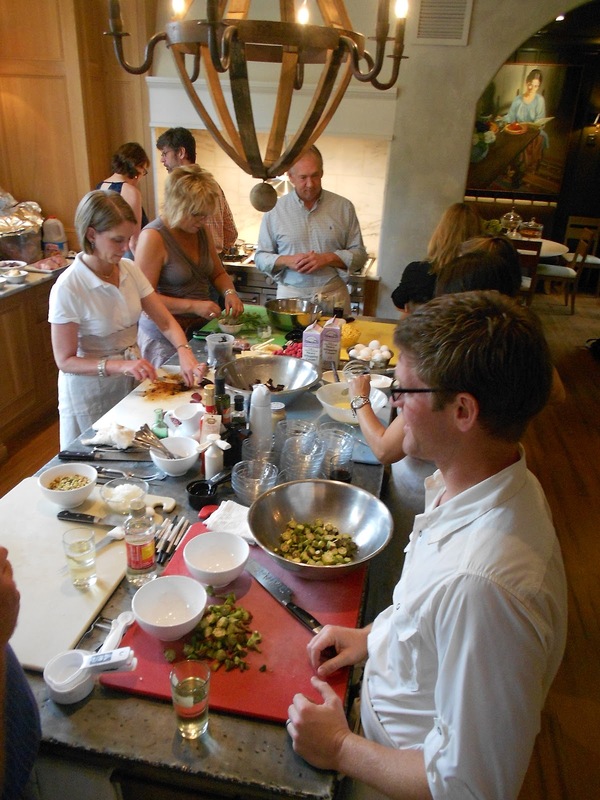 The featured chefs are down-to-earth people who make preparing great food approachable for every level of cook. What are you waiting for? 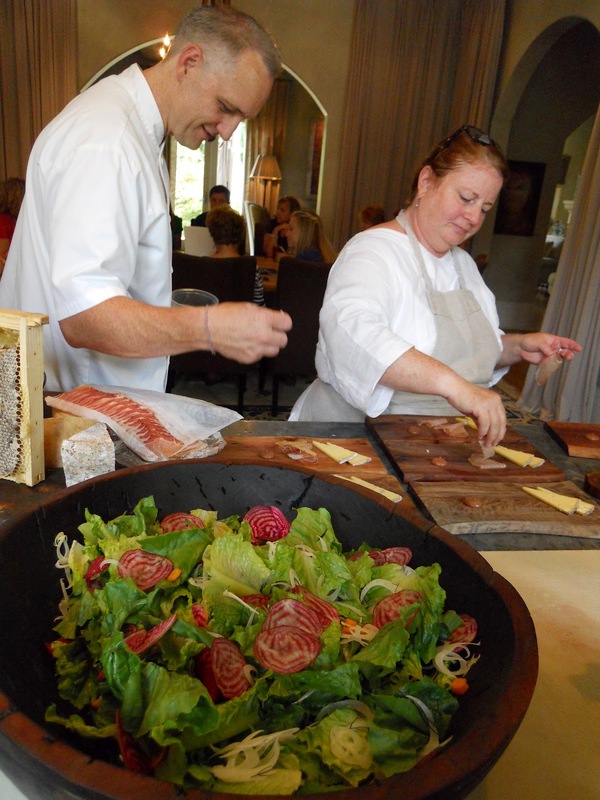 Join us this year for what Forbes lists as 1 of 5 Foodie Fantasy Camps. 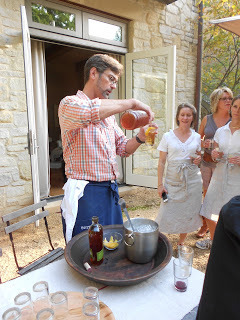 Call the Inn at Serenbe today to register, 770 463 2610. Brush each side of the bread with olive oil and toast under the broiler or on a grill. Pick through the crab meat to ensure there are no shells; try to retain the large pieces of crab. Toss the crab with the lemon juice, 1 tablespoon olive oil, and season with salt and pepper. Top each slice of toast with crab. Put small dots of spicy mayonnaise on top of the crab and garnish with the freshly picked herbs. 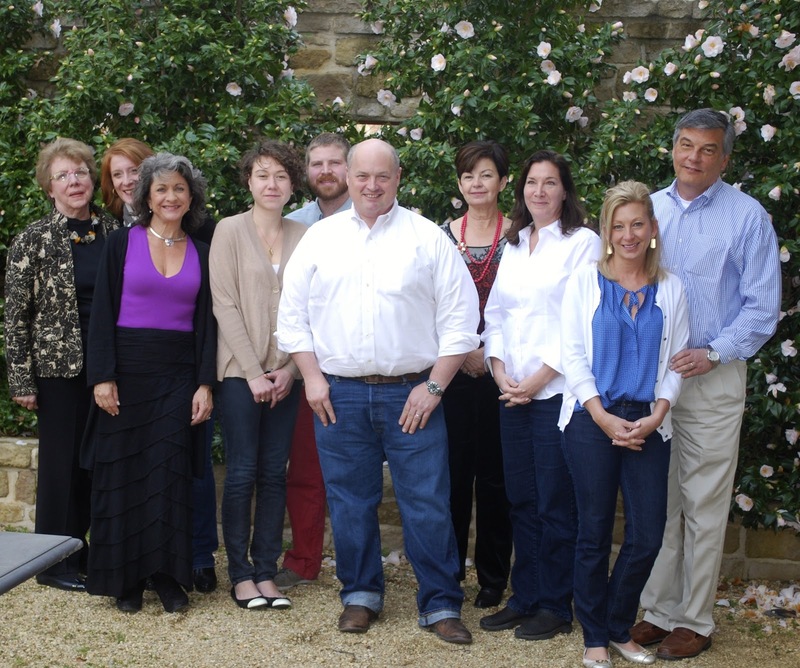 January 20 and 21 marked the kickoff to the new year for the Southern Chefs Series, now in its 4th full season. 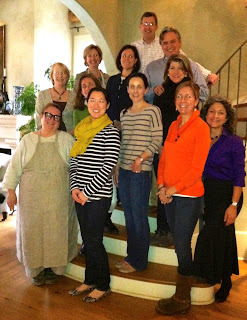 Ten eager participants arrived at my door on Sunday afternoon to learn from a master. Chef Linton Hopkins of Restaurant Eugene, Holeman & Finch Public House, and H&F Bread Co. and a 2012 co-winner for Best Chef Southeast by the James Beard Foundation, donned his apron, unpacked his coolers of food, and began instructing his protégés in the preparation of what was termed a “Southern Masala” dinner, this to be contrasted with the next day’s “Southern Classic” lunch. The mood was light, the instruction complete, and the resulting meals delicious, colorful, and world’s apart in flavors, despite the fact, as Chef Linton pointed out, southern India and Georgia are on the same latitude and have many foods and preparations in common. Uniquely, none of the students had attended any previous Southern Chefs Series classes, but all left indicating they plan to enroll in additional classes, citing the intimate setting, personal interaction, and Linton’s attention to each person as favorite aspects of the class. Fabulous, wonderful, and beautiful are adjectives participants used to describe the experience. Our Sunday Masala Dinner featured tandoori BBQ chicken and pork shoulder, fragrant butter-laced pureed mustard greens (recipe below), sea island red pea dal, kale chaat, corn bread with radish, accompaniments (including a saffron laced mango chutney with almonds), and sweet spoonbread with buttermilk and persimmon lassi. Monday’s Southern Classic lunch included shrimp salad with citrus, lettuce, and fennel; winter squash soup with bacon and herbs; buttermilk yeast rolls; and old fashioned chocolate cake. 1. Destem and wash all greens thoroughly and chop coarsely. 2. 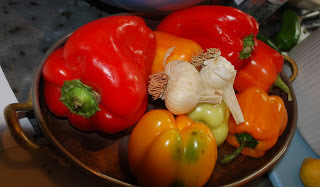 Place corn flour, onions, and serrano chilies into water and bring to a boil; add the greens and bell pepper and 1 tbl of kosher salt; bring back to a boil and simmer for 1 hour. 3. Puree in small batches with a food processor until smooth. 4. Add the cornstarch mixture and cook until thickened and smooth. 5. Heat ghee in pan, add aromatics, and cook until they just begin to brown. 6. 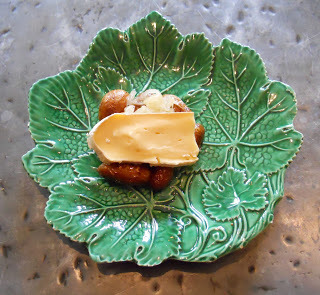 Place greens in serving vessel and stir in fragrant ghee. The proceeds from this expanded season of the Chefs Series will benefit Wholesome Wave as it prepares to establish additional chapters in the South, making fresh, healthy, local fruits and vegetables affordable and accessible to all. 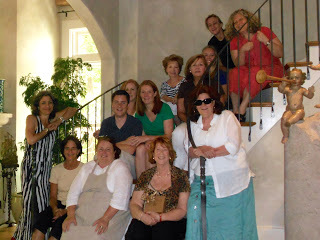 All of us involved (the chefs, Lori and I who assist, and the photographers) are doing so free of charge. We will publish a cookbook, also benefiting Wholesome Wave, at the conclusion of the 2013 series, featuring the chefs and recipes from each month. Registration for future classes is still open. Call the Inn at Serenbe, 770 463 2610, to reserve your space. I am thrilled to welcome this year’s outstanding chefs to my kitchen and hope you will join us. This month, Steven Satterfield, of the acclaimed Atlanta restaurant Miller Union, graced my kitchen for the November installment of the Southern Chefs Series. What a great time we had! Steven is gracious, funny, interesting, and a consummate professional. Oh, and how he debones a chicken, making it look effortless…crazy good. Steven’s menu included wonderfully savory flavors one associates with autumn: grilled pork tenderloin with an apple cider vinegar basting sauce; roasted butternut squash and apples; farro and roots; bean salad in vinaigrette, featuring field peas and roma beans; a crispy salad tossed with a tangy Dijon mustard/champagne vinegar/ginger root dressing; griddled pastured chicken (see photos); a to-die-for potato, sweet potato and sunchoke salad; and roasted pepper and eggplant soup (recipe follows). We chopped, diced, and roasted to our heart’s content, and the results were outstanding. It’s impossible, really, to fully describe the complexity of the flavors. Suffice it to say, we are excited that Steven will be returning for the expanded 2013 Southern Chef’s Series. In the coming year, he’ll be our June chef. I’m already looking forward to experiencing an early summer menu of Steven’s. I know we will be equally impressed and completely sated after those meals. Please enjoy Steven’s soup with its subtle hint of heat and savory goodness. You’ll want to serve this soup with a crusty loaf of bread so you can soak up every drop…it’s that good. Heat butter and olive oil in a soup pot and add onions, garlic, thyme, salt, and pepper. Sweat until translucent. Add roasted vegetables, stock, and remaining ingredients. Simmer 30-45 minutes and taste for seasoning. Remove bay leaf and blend until smooth. Serve hot in individual bowls. Garnish with smoked paprika and drizzle with olive oil. What an Afternoon in the Country it was! The Atlanta chapter of Les Dames d’EscoffierInternational held its 12th annual Afternoon in the Country fundraising event here in Serenbe on November 4th. It was a spectacular afternoon! We enjoyed glorious fall weather, and the sold out crowd (numbering over 1,800) kept the energy high all afternoon. 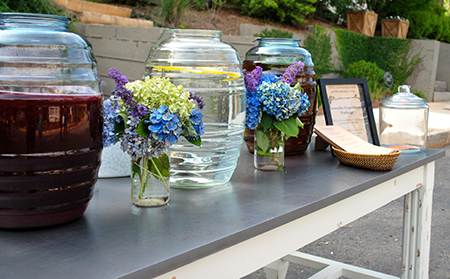 The who’s who of the Atlanta metro area’s hospitality industry were on hand serving delicious food and thirst-quenching libations to the guests. This was a special year for me in that I was invited to join the ranks of Les Dames as a member this summer. As well, I participated in the event with my restaurant The Farmhouse. 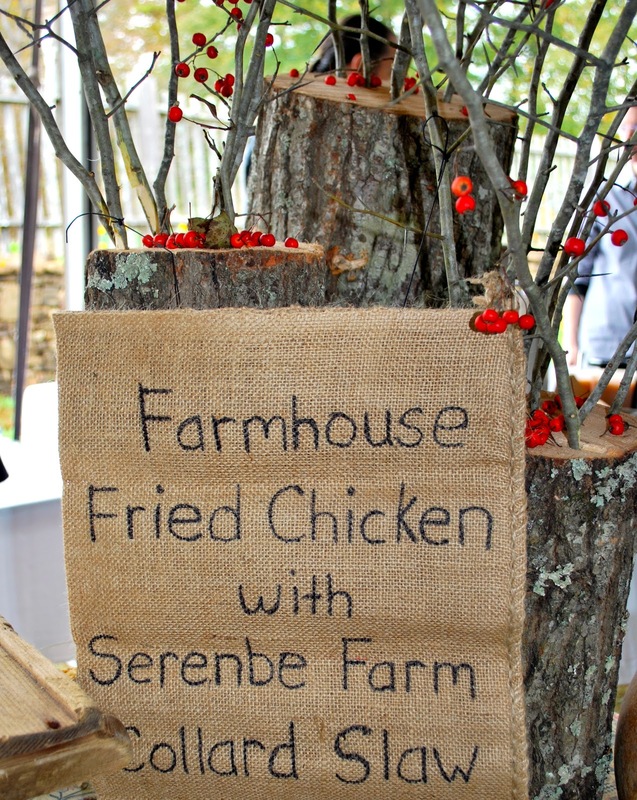 At our table, we served Serenbe Farms collard slaw (recipe below) and the Farmhouse’s now famous fried chicken. 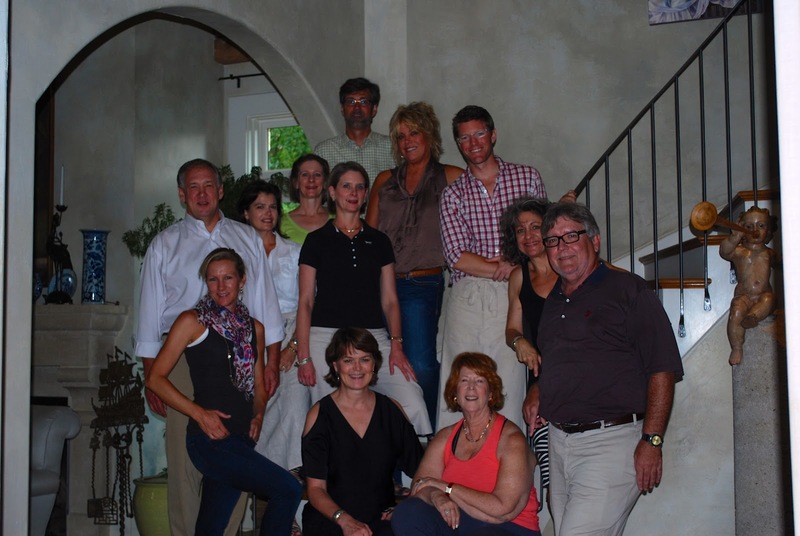 Serenbe’s other eateries, the Hil and the Blue Eyed Daisy, were also participants. 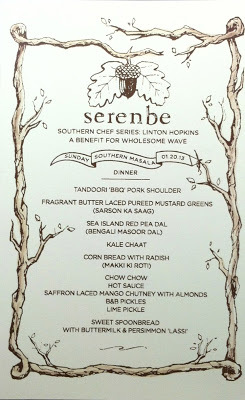 It’s rewarding to have Serenbe fully represented at this event. 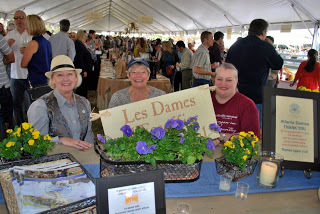 Proceeds from ticket sales and a silent auction raised nearly $100,000 and benefitted the Les Dames’ scholarship fund, Wholesome Wave, and Georgia Organics. A highlight of the afternoon is always the cake raffle; this year’s raffle did not disappoint. 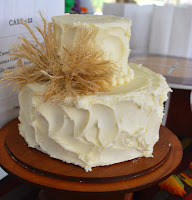 Beautifully decorated and uncommonly delicious cakes from the areas best bakers garnered much attention. For many Serenbe residents, Afternoon in the Country is the event they most enjoy. The audible buzz of conversation and laughter confirms this is many people’s favorite event. For those of us on the serving side of the tables, it’s an afternoon of constant activity – an invigorating and exhausting day. When the event wraps up, I’m equally happy for the chance to sit down and sad that we have to wait another year for it to happen again! We are so fortunate to be the host locale for this terrific event. I hope you’ll join us next year. Whisk all vinaigrette ingredients together. Place all slaw ingredients in a large bowl. Toss with the vinaigrette. Garnish with the chopped peanuts. Serve and enjoy. 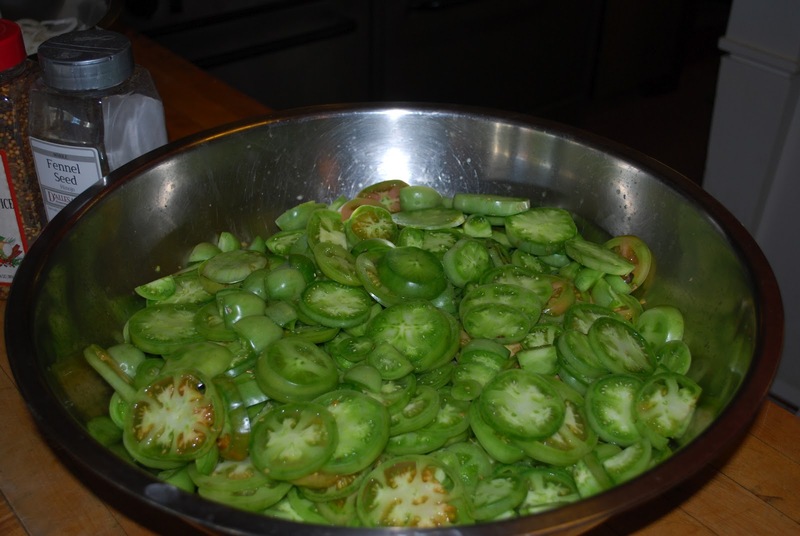 What do you do when you have a bushel of green tomatoes? You pickle! 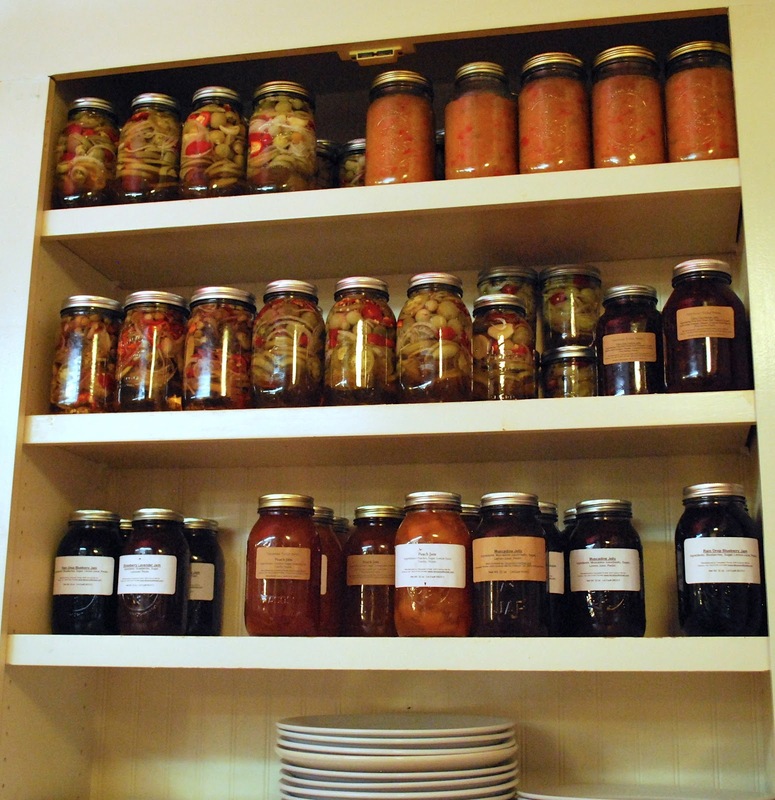 On a recent afternoon, I enlisted the help of Joy Belyeu of the Farmhouse, and together we put up 36 quarts of pickled tomatoes and onions, all from the Farmhouse’s garden. I love to can! Every step requires strict attention to detail to ensure that not only is the end result food safe but also it tastes good. 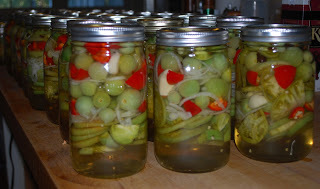 I have an added criterion in that I like my pickled goods to look good in the jar. To that end, it’s all about the layering and colors. 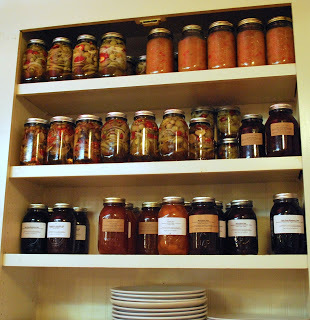 Since the jars will sit on an open shelf in the Farmhouse kitchen, why not have the contents be colorful as well, adding a dash of red in an otherwise green and white landscape? 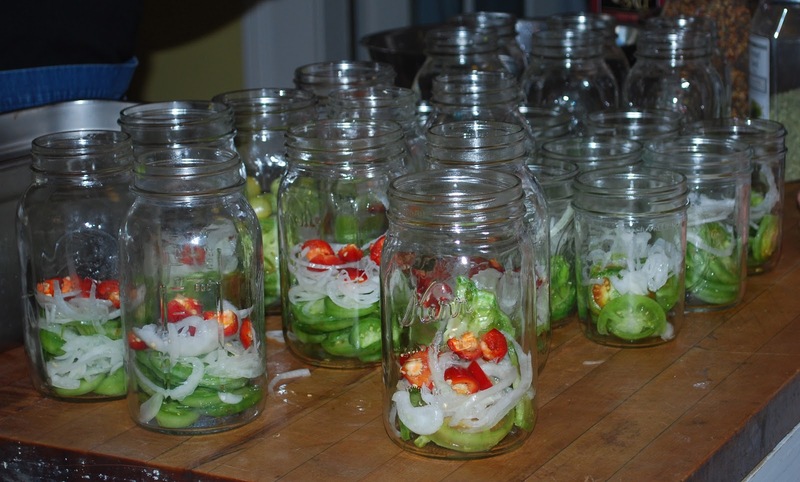 I taught myself how to can when faced with an abundant bounty from my and Steve’s first garden in Serenbe – before we opened the Serenbe B&B (which later became the Inn at Serenbe). Acclaimed landscape designer extraordinaire Ryan Gainey designed our vegetable garden, and Steve put it in. Ours is the only vegetable garden for which Ryan accepted a commission. And what a garden it has been for us and now for the Farmhouse at Serenbe! I’m encouraged that the practice of canning and pickling is experiencing a resurgence. Information abounds on the Internet about how to can. Ball has a great website, complete with recipes and instructions, as does the National Center for Home Food Preservation. 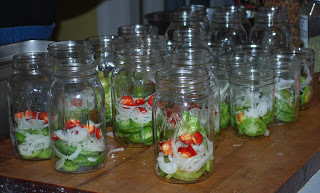 There are terrific economic and health benefits to taking up the practice of home canning and pickling. With an abundance of fresh produce at area farmers markets, now is the time to dive in and learn to can. Come to the Serenbe Farmers Market on Saturdays, 9 am – 12 pm, now through November, and pick up your favorite produce so you too can enjoy the fruits (and vegetables) of your labor in the middle of winter. Combine vinegar, water, sugar, and salt in a nonreactive pot and bring to a boil. Stir to dissolve sugar and salt. Pour the mixture over the vegetables in a large glass bowl and cover with a plate to submerge. Let stand at room temperature until cool. Then can place in a plastic container and refrigerate. Good for 1 month. This has been a banner year for Southern Chefs Series chefs as three are 2012 James Beard Foundation top chefs, two for the Southeast region (GA, KY, NC, SC, TN, WV) and one for the South region (AL, AR, FL, LA, MS). 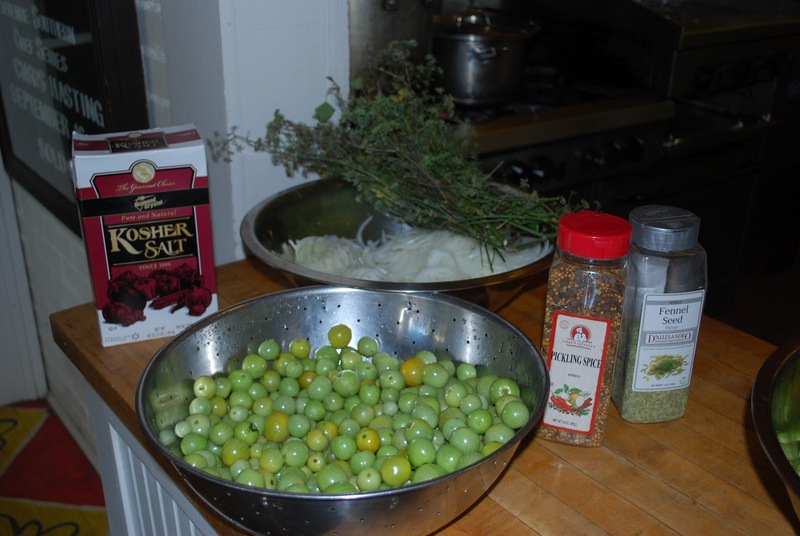 Earlier in the season, we hosted Linton Hopkins and Hugh Acheson, who shared the award for the Southeast region, and this past Sunday and Monday, Chris Hastings, the South region’s honoree made his first trip to my kitchen. In addition to his James Beard award, Chris beat out Bobby Flay earlier in the year on Iron Chef America! 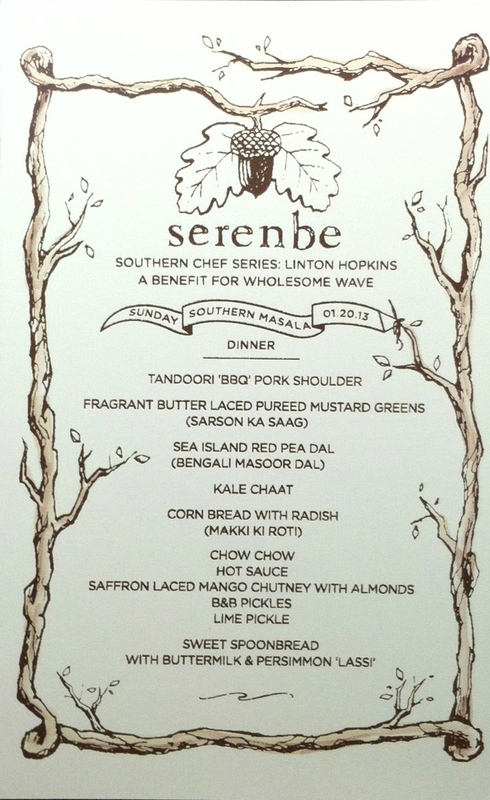 The BEST chefs really do come to Serenbe; I hope you will also! Chris, chef/co-owner of Hot and Hot Fish Club in Birmingham with his wife Idie, had been a finalist in the category previously. He was up against four chefs from New Orleans this year and beat out the competition. Cook with him, and you’ll soon find out why he was chosen! Chris is a brilliant chef who makes cooking seem effortless. I’m excited he accepted the invitation to teach this year and is on the schedule for next year as well! The ten participants in his class this past weekend were the winners for having registered for his class. His rapport with students of all skill levels is something to behold. He is down-to-earth and wonderfully personable. It was fun to have Chef Chris in my kitchen. He is the first visiting chef to include a cocktail hour (complete with a signature cocktail) with his class. Chris’ was the Donnie Draper Cocktail made from his housemade bitters and sassafras syrup. This was a smooth libation and so tasty you’ll want to drive to Hot and Hot to try it for yourself. It’s got a kick, so plan for a designated driver. And, as it’s dove season, he also treated us to doves harvested the day before, and what a treat they were! If you missed his class this year, call now to register for his class next year, July 28-29, 2013. 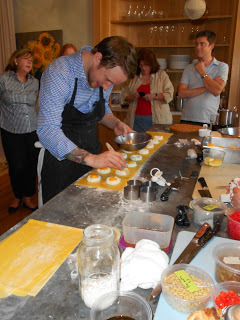 Classes for the 2013 Southern Chefs Series are already filling up. If you want a chance to learn from Chris and any of the other outstanding chefs, call the Inn at Serenbe today to reserve your spot, 770 463 2610. 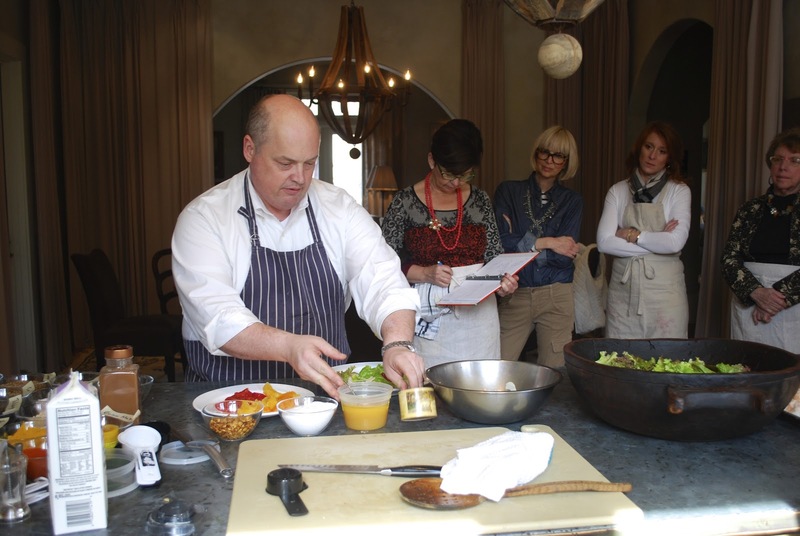 In the meantime, try Chris’ outstanding recipe for shrimp gazpacho with lemon oil. It is refreshing and satisfying. This is our Southern take on a classic Spanish soup. Because it is always served cold, it is a light and refreshing meal for a sultry Southern day. You can substitute jumbo lump blue crabmeat for the shrimp, if you prefer. Many good olive oil companies also produce lemon oil in which the olives are pressed with fresh lemons, creating fragrant, flavorful oil. Lemon oil adds a bright, rich quality to this soup. Slice each of the tomatoes into 4 quarters. Place the tomatoes in a food mill and turn until all of the juice is extracted. You will need about 2 cups of the fresh tomato juice. Discard the tomato seeds and peel. Alternatively, the tomatoes can be seeded, roughly chopped, and pureed in a food processor or blender. Strain through a fine-meshed sieve and discard any solids. Combine the tomato juice and the next 9 ingredients (cucumber through vinegar) into a large bowl, stirring well to combine. Season the soup with the salt and pepper and stir in the diced shrimp. Refrigerate for at least 2 hours or until the soup is well chilled. Ladle the soup into serving bowls and garnish each serving with 1 teaspoon of the chopped basil and 1/2 tablespoon of lemon oil. Serve chilled. 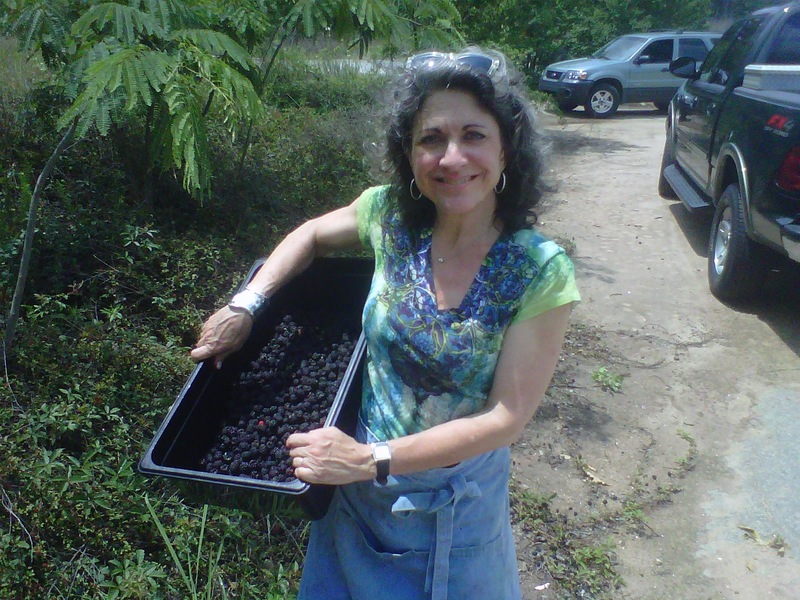 Access Atlanta recently published a story, “In season – blueberries,” about this luscious berry and featured two of my recipes for using this glorious fruit. Though our local growers may have sold out their crop for the season of pick-your-own blueberries, you can still find them in the grocery stores. Berries – all varieties – seem like the ultimate summer fruit. 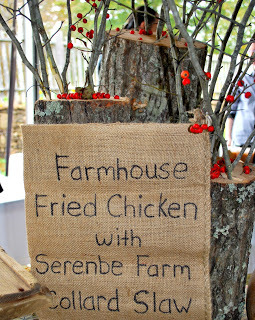 As you know, the weekly menu at my restaurant, The Farmhouse features local and fresh produce grown in our garden at The Farmhouse, the Serenbe Farms’ fields, or from other local farms. When summer berries are at their peak, we feature them in sweet and savory dishes. I like the versatility of berries. Picking blueberries on a summer morning. 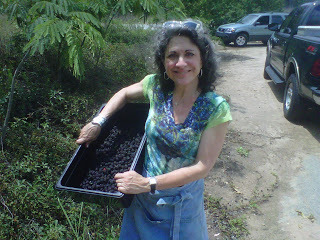 My berry cobbler recipe in the Access Atlanta story (and below) can be modified to use any berry; I’ve used them all with success and encourage you to do the same. Put butter into a 9-by-13-inch baking dish and place in oven while oven is preheating. Remove when butter has melted; this may take up to 10 minutes. In a medium bowl, whisk together sugar, flour, baking powder and salt. Whisk in milk until batter is smooth. Pour into melted butter in baking dish. Scatter fruit across the top. Bake cobbler 30 minutes or until cobbler is cooked through and top begins to brown. Serve hot or warm with ice cream. For each serving, puree 1/4 cup fresh blueberries with a tablespoon of brown sugar and some fresh lemon juice. The puree can be strained before it’s mixed with a jigger or two of rum and topped off with a half cup of ginger ale and served on the rocks in a tall glass. Please enjoy this refreshing libation responsibly. The Serenbe Southern Chefs Series welcomed back Anne Quatrano, the powerhouse behind such Atlanta institutions as Bacchanalia, Abattoir, Floataway Café, and StarProvisions. Anne brought her expertise to my kitchen on July 8 and 9 and delighted her students with a menu of tantalizing dishes for Sunday evening’s class: roasted, marinated beets with goat cheese (see recipe below); egg yolk and ricotta ravioli with summer squash and zucchini (see photo left); pan-roasted north Georgia trout with Carolina Gold rice risotto and caponata; and peach brown butter tart. Christopher Schmidt, executive chef of one of Anne’s restaurant’s, Floataway Café, made the preparation of that evening’s meal seem oh-so-simple. preparing one of several cheese courses. Monday brought a new day and a twist on the series, with Anne and Tim Gaddis, the cheese monger at Star Provisions, hosting a cheese tasting in place of a cooking demonstration. 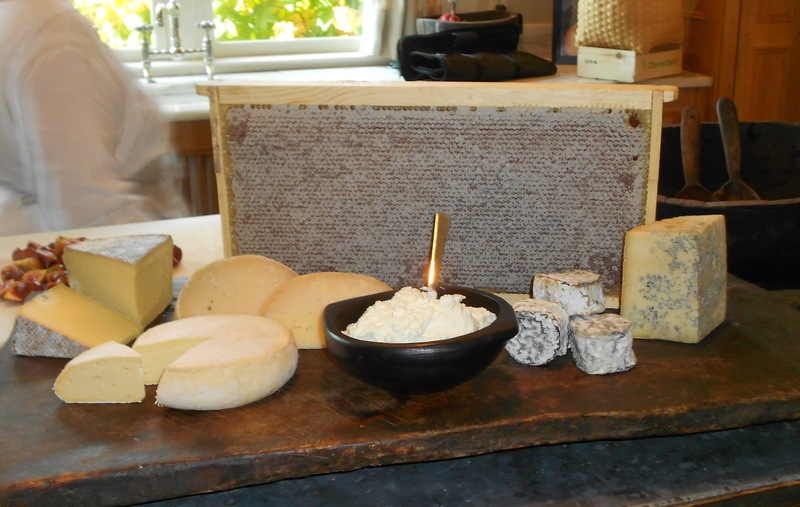 The cheese selections were many, varied, and all from artisanal cheese makers in the South. 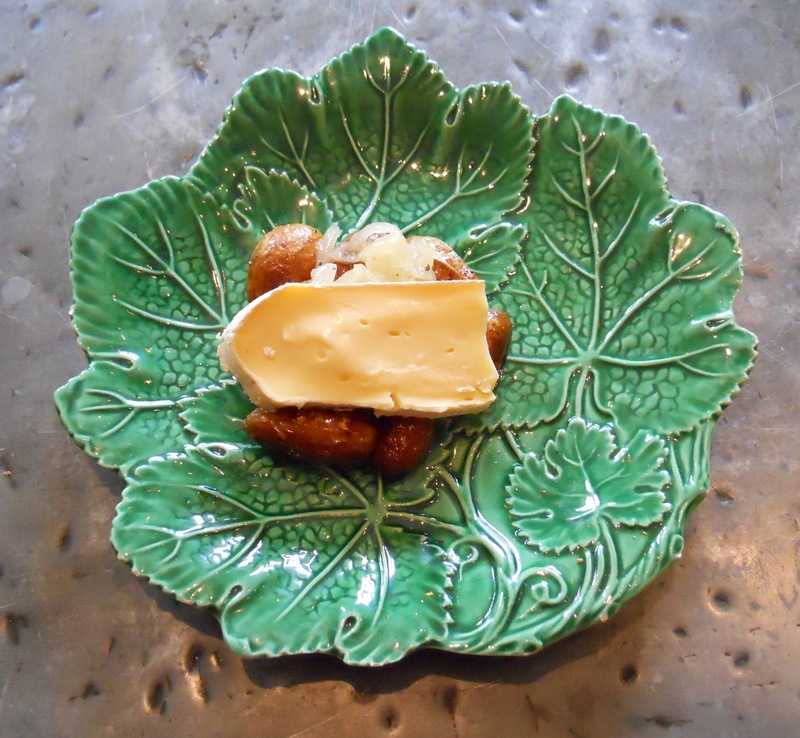 The accompaniments, which included fresh figs, cured meats, toasted hazelnuts, sautéed fingerling potatoes, caramelized onions, and Serenbe honey, perfectly complimented the cheese selections and, with a salad tossed with Anne’s homemade Green Goddess dressing, made for a satisfying meal. 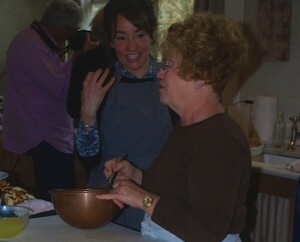 It was a privilege to open my kitchen once again to Chef Anne; she is an inspiring and inspired chef. I think you will enjoy her roasted beets. The flavors and colors of the ingredients were brilliant together. Enjoy! Place washed beets in a deep roasting pan. Fill pan ½ way up the beets with water. Add vinegar, butter, honey, salt and pepper. Cover tightly with aluminum foil and roast in a 350 degree oven for 1 ½-2 hours or until a knife goes easily into a beet’s center. Remove from oven and remove from cooking liquid; reserve cooking liquid. Wearing gloves, peel off the exterior skin and quarter beets while still warm. Strain the cooking liquid through a chinois, season to taste with salt and pepper. Toss beets with reserved cooking liquid. 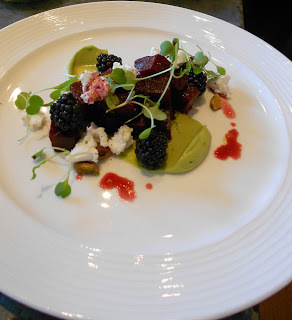 Serve with fresh goat cheese, avocado, pistachio, blackberries and baby arugula.